By far the largest beer festival in the world, Oktoberfest attracts more than 7 million visitors to Munich every year. The team at Viator, a TripAdvisor company and the leading resource for tours and activities worldwide, has announced a selection of local experiences available during the 16-day festival (Sept. 17 – Oct. 3) to bring travelers into the tents at the forefront of the Oktoberfest action. Given the popularity of the festival and the “limited-time-only” nature of the event, some dates and tours have already sold out, so guaranteeing access in advance by booking ahead with Viator will help travelers avoid missing out on the Gemütlichkeit – a unique state of warmth and good cheer (coupled with some yummy brews). All activities are available for travelers 16-years and up unless otherwise noted. The Munich Segway Tour During Oktoberfest (through Oct. 3, with some dates already sold out) is a guided, educational and entertaining, 2.5-hour small-group Segway tour that takes in all main attractions like the Hofgarten, the Munich Residenz, the Viktualienmarkt, Englischer Garten, Marienplatz and Hofbräuhaus and more — stopping frequently to hear fascinating stories, take pictures and discuss Munich’s history. Travelers can get an insider look at the world-famous festival with Munich Oktoberfest Tickets and Tour (Sept. 18 – Oct. 3). The tour starts with a narrated walk through the festival grounds and takes a spin on the Ferris wheel before settling in at the lively Hofbräu-Festzelt tent to soak up the raucous culture with a roast chicken dinner with 2 liters of beer included. 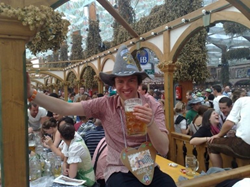 The Munich Oktoberfest Overnight Camping Package Including Breakfast and Dinner (Sept. 17 – Oct. 3) begins with hearty breakfast at the campsite in the morning before heading over to the festival with a guide. Revelers will sing centuries-old drinking songs, wander the beer tents, and try Bavarian dishes then head back to the campsite in the evening for Stoketoberfest, the after-party. Guests enjoy barbecue, live bands, more beer (of course), and “carnivalesque” celebrations with 2,500 or more international guests every night. Packages include 2, 3 and 4-night options and are appropriate for travelers 18 and over. The Munich Oktoberfest Reserved Table at Käfer or Pschorr Tent Including Oktoberfest History Tour (Sept. 19 and 20; must be 21 and over to participate), explores the best of Bavaria’s beer culture highlighted by a reserved table at Käfer's Wies’n-Schänke or the Pschorr-Bräurosl. Travelers take a seat and enjoy the traditional brotzeit platter, which includes traditional Bavarian bread, cheese, mixed meat, onions and pickles. As the beer-fuelled celebrations ramp up, guests can listen to live music from the brass band while enjoying all the Bavarian beer they can drink. Available on one-day only (Sept. 26) the Small-Group Munich City and Oktoberfest Tour Including Reserved Oktoberfest Tent Table is a 7-hour experience that includes a Munich city tour and a guaranteed spot inside a tent at the 200-year-old festival at Theresienwiese. This small group tour with a maximum of 20 guests (10 travelers per table) includes two liters of beer and a half-chicken dinner. With the evening free to experience the sights, smells and sounds of the Oktoberfest, travelers can enjoy a mix of traditional activities (like the shooting galleries) and rides, such as the free-fall tower. The All Inclusive Oktoberfest Tour and Table Reservation at a Major Tent (Sept. 26 – 30; 21 years and older) features jumping the queues and skipping-the-lines as travelers enter the festival. Travelers will explore the historic Theresienwiese and gain insight into Bavaria’s rich brewing heritage, then take a seat inside one of the Oktoberfest tents. They'll savor a traditional Bavarian lunch and swill as many steins of beer as desired! Afterward — when the party ramps up — guests drink and dance into the evening as Bavarian music fills the tent. To cap off the 16-day event, travelers can try An Evening at Oktoberfest at the Hofbrau Tent Including Dinner and a Historical Walking Tour (Oct. 3 only; 21 years and older). Visitors tour the Oktoberfest grounds and learn about the history of each tent, Lederhosen and the festival spirit, then head to the world famous Hofbrau tent for a stress-free evening including a reserved table where beer and food will be waiting. An expert Oktoberfest guide will be on hand to answer questions, help with ordering, and explain local customs during the four-hour reservation. For information on these Oktoberfest experiences and thousands of insider experiences all over the world as well as the latest deals, promotions, contests and news, travelers can visit http://www.viator.com or follow Viator on Facebook (ViatorTours) and Twitter (ViatorTravel).